I just came across the event organized by Malar this month. It’s a lovely event, the theme tells you everything about it – Kitchen Disasters. Kitchen disasters are not a new thing in probably anybody’s kitchen, especially for those who recently got married or just moved away from home. When I started cooking a year and a half back even I faced such problems frequently. Kitchen mishaps have now gone down because of the practice, but of course it’s not extinct. But when it comes to baking I am always there to do some kind of mishaps. The main reason behind this probably lack of a proper baking oven. I always try to bake something in the microwave oven and it turns out to be awful. Just last month, after much searching on the internet I got hold of a youtube video which taught to bake a cake in a cup in the microwave. I followed the steps, and the result was horrible. The first one was hard like a stone with an entirely blackened core. One burnt cake could not turn me down, I tried with the other one – that was even worse than the first one, it looked like a cake, but couldn’t eat it. It was so spongy, that my sister and myself started pulling from both sides to tear it into two pieces. I clicked an image of this disaster, and was waiting for the right time to publish this. And what better way can I find but to send the entry for an event. The burnt cake chapter never turned me down, and so I was again in search of something to bake in the microwave oven. This time it came to my google reader, a post on microwave cookies by Indrani. I was very happy to get this post. First, the post was from a very loving person. Second, the cookies were baked in the microwave oven. I followed almost the same way as Indrani’s but made a little change but preparing two types of dough – one with honey and the other with chocolate, just to bring a little color to the cookies. I used the Cadbury chocolate, broke them down into small pieces. The cookies, to my utter happiness turned out to be good, at least not burnt or having some disastrous textures. But, they were a little hard which was probably because of over baking them. When I asked Indrani about it she said to Microwave the cookies for a less time. Microwave high (800watts for my MW) for 3-4 mins; let them cool inside the microwave oven. Keep in an air tight jar and feast on them whenever you feel like. Hot Tips – When baked in the microwave oven, the cookies start getting baked from the centre, so check the cookies in between baking once to make sure they don’t get over baked. Sending this post to Malar Gandhi for hosting a wonderful event –Kitchen Disasters. you can’t send this cookie recipe to both events like – kitchen mishaps and cookies/cake event. I am looking for perfect recipes. I am so sorry. .-= mahimaa´s last blog ..Cabbage Paratha =-. Thank you so much for your wishes :). One of my constant failure was in bread baking! But now my breads are decent! Never took any pict of my failure! Cookies never thought doing in microwave! All thanks to Indrani who showed me the way to bake cookies in MW, and they turned out pretty good. MW te cookies ,lovely! ,have you checked the recipe well before trying it..onek samay recipe itself states some wrong steps or ingredients , amaar sathe eyi ta onek baar hoyeche , tai ami baking er jono ekta site ache Allrecipes , er chara onek kom hi recipes kotha O theke try kori, tobe tumaar eyi recipe ta nischoyi try korbo , amaar meyer bhalo lagbe spiral cookies khete :).. I never captured my disasters as picture, cookies looks prefect for me..Malar will be very happy to get this entry for her event..
.-= Priya´s last blog ..Portuguese Tomato Rice/Arroz De Tomate =-. Thank you so much for dropping by. I can’t recollect why I had taken this pic, probably was taking for such events at the back of my mind. Anyways even at times disasters help :). At least they give a little potion to laugh at yourself. Thank you so much for your comment here. Is there any way to make the cookies soft but crunchy in MW? I’m sure your girl will love it. 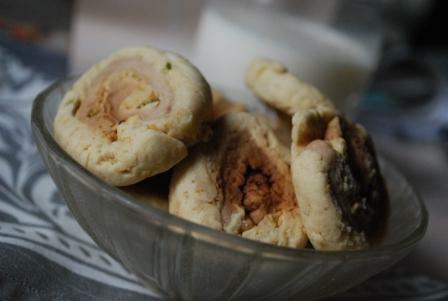 I too have the disasters especially while baking only…till now I am little scared to bake a cake..Thanks for sharing…its very interesting to read..between your cookies looks awesomw..
Microwaved cookies -amazing never baked in this way before.They loom lovely. .-= simplyfood´s last blog ..Chocolate ~ Vanilla cheesecake =-. love the cookies and the story behind it.never tried any baking in micro that seems easy.love these cookies Sudeshna so as the pictures. Thank you so much for the comment. Even it was my first good result baking expedition in MW. .-= Happy Cook´s last blog ..Jam Roll =-. Oh, then just write about them. We can have a good laugh at it then :).